• Threat intelligence improves security operations center (SOC) efficiency. • Threat hunting and incident response are enriched by threat intelligence. • Intelligence sharing can be done right, in the aviation security community and beyond. Dave Ockwell-Jenner has an extensive background in technology: from building one of the internet’s earliest major websites, to helping secure some of the world’s most critical systems. 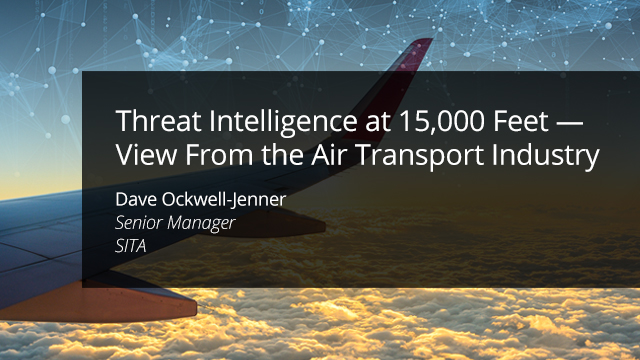 In his current role with air transport industry IT provider, SITA, Dave leads a team of cyber security professionals dedicated to protecting critical infrastructure against cyber threats. Cyber threat intelligence is a central part of SITA's security strategy, not just to defend the enterprise, but to extend a suite of capabilities to customers, partners, and the industry as a whole. Originally from the UK, Dave now lives with his family in Kitchener, Ontario, Canada — home to one of Canada's most vibrant entrepreneurial and high-tech communities.